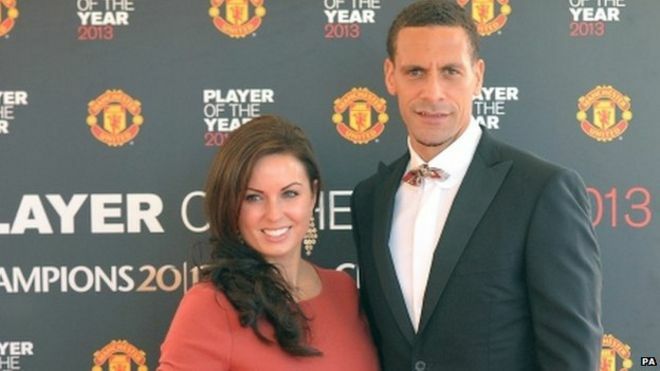 The wife of former Manchester United and England captain Rio Ferdinand has died from cancer. The QPR defender, 36, released a statement saying his “wonderful wife and soul mate” Rebecca Ellison had “passed away peacefully” at a London hospital. Ms Ellison, 34, who married Ferdinand in 2009, had breast cancer. She leaves behind three children, Lorenz, nine, Tate, six, and four-year-old Tia. In a statement, Ferdinand said she died on Friday night. “Rebecca, my wonderful wife, passed away peacefully after a short battle with cancer at the Royal Marsden Hospital in London,” the footballer said on QPR’s website. Ferdinand thanked the staff who treated his wife at the south London hospital, adding: “I would also like to express my gratitude for the dedication and expertise of the staff led by Professors Johnstone and Clarke at the Royal Marsden. Messages of support have been posted on Twitter from the world of football. QPR’s players will be wearing a black armband for the match against Liverpool at Anfield later. Ferdinand, who grew up in Peckham, south-east London, was capped by England 81 times and has also played for West Ham United and Leeds United. Will Salman Khan evade jail and get bail?